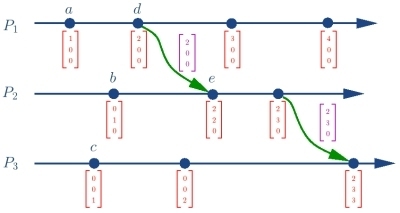 The Fidge/Mattern's Vector Clock makes it possible to imply the happened-before relation by comparing the timestamps of the events and vice versa. Where C(i) is the vector clock timestamp of event i. Comparison complexity is order of n where n is the number of processes. The following is a property of vector clock where e and f are events on processes pi and pj, respectively.